One of the best things about BEA is finding out what books the publishers are excited about. Case in point... when I was at the Atria party, I was handed a copy of THE VERY THOUGHT OF YOU by Rosie Alison. While I was attracted to the plot (and the cover), I'm not exactly sure it's a book that I would have picked up if it weren't placed directly in my hands with a personal recommendation. Heck, even though THE VERY THOUGHT OF YOU was shortlisted for the 2010 Orange Prize, I honestly can say that it wasn't even on my radar. That's the beauty of meeting "book" people and just talking about books -- every once in awhile, you stumble upon a gem. That's what THE VERY THOUGHT OF YOU was to me -- a gem of a book. It's an incredibly beautiful love story that deeply touched my heart. It wasn't always a happy read, and it certainly wasn't an easy read. However, it is a poignant story about the many different types of love. And it is a story that is likely to stay in your thoughts for a very long time. 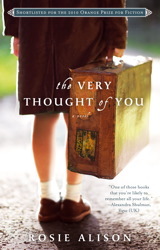 THE VERY THOUGHT OF YOU tells the story of Anna, an eight year old girl who is sent away from London on the brink of World War II. Anna ends up in Yorkshire at an Ashton Park estate where a childless couple is running a boarding school for displaced children. Initially, Anna desperately misses her mother; however, it doesn't take long before she becomes caught up in events at Ashton Park -- and especially Thomas Aston, her host and guardian. When Anna discovers secrets about Thomas and his wife's relationship, her life is turned upside down and she is forced to keep many secrets. These events have a long-lasting impact on her entire adult life. "Of all the people we meet in a lifetime, it is strange that so many of us find ourselves in thrall to one particular person. Once that face is seen, an involuntary heartache sets in for which there is no cure. All the wonder of this world finds shape in that one person and thereafter there is no reprieve, because this kind of love does not end, or not until death..."
But Ms. Alison also manages to shines in her character development. So many of the characters in this novel, from Thomas, to Elizabeth, to Anna, to Anna's mother, were extremely fragile and very damaged. I loved how she captured the complexity of their characters as well as the effects that the war had on these individuals. In addition to the writing, I deeply appreciated how this novel explored the theme of love. Initially, I thought the story might be just a love story (and it was), but it was so much more than that. This novel delved into almost every aspect of love in society. There was parent/child love, adulterous love, passion, unrequited love, and lost love. THE VERY THOUGHT OF YOU was definitely a heart-breaking look at love and how much our lives can be affected by love, loss and even unrequited love. There is so much more that I could say about THE VERY THOUGHT OF YOU, but I think it's best to explore this novel on your own and make your own judgments. It's because I feel this way that I think THE VERY THOUGHT OF YOU would make an excellent book club pick. There is a little bit of historical fiction elements along with some very insightful glimpses into human behavior; and I have no doubt that there is a great deal to discuss. There is a reading guide available which delves into many of the issues I mentioned earlier along with the themes of deceptive appearances, memories, marriage, romance, alcoholism, relationships, and forgiveness. I do believe that this novel will evoke strong feelings and cause each individual reader to take something different away from the story. If you are in the mood for a beautifully written and very thought-provoking novel about love and relationships, then I highly suggest THE VERY THOUGHT OF YOU. I'm really eager to read this book. Sounds like a beautiful read. Thanks for sharing!! Wow, it sounds like this book was shortlisted for the Orange Prize for a good reason. I'm really wondering about the secrets Anna is forced to keep. I love books that make good book club selections, because that means there is a lot to think about! I don't know if this is a book I would have picked up either. After reading your review though, I will put it on my must read list. I too am curious about the secret Anna is forced to keep. Thanks for the great review and putting this book on my radar! I have been interested in this book since it was shortlisted for the Orange Prize, but no review has piqued my interest as much as yours. It sounds like I should try this out. This sounds like one I must read. Thank you for the great review. I think I want to read this one, great review! I read and really enjoyed this book even though it was melancholy in places. Like you, I am not sure I would have picked this up had someone not brought it to my attention. I read this, but didn't like it anywhere near as much as you did.